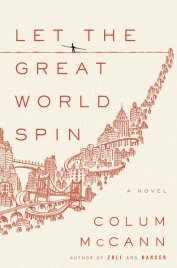 I just finished reading Let the Great World Spin for the first time, and I’m a little stunned by it. It’s basically a collection of interconnected short stories, all circling around the day Phillippe Petit strung up a wire and walked between the twin towers. It’s a beautiful book, and a great deal of care obviously went into deciding where to place each story. In addition to the artfully constructed plot, there are also moments where his wording, the way McCann conveys a feeling, feels like music. The simple things come back to us. They rest for a moment by our ribcages then suddenly reach in and twist our hearts a notch backward. I don’t want to spoil the piece of this story, since his slow reveal of information in this chapter was the best part about reading it, but basically the character here is remembering something simple, and nice, and you feel the calmness of it with the way the moment “rests”, which is what a nostalgic moment feels like. But then it “twists” her heart back (such a harsh word, when you think of it, say it out loud) and brings her back to the painful thought that ultimately accompanies any small, good memory she has.